Can you hook your local bobby on the beat up with a date this Valentine’s Day? They’ve been stood up. Sussex Police are smitten by Pamela McQuade from Bognor, who is wanted for failing to appear at court. To make her even more appealing to police, officers suspect the 44-year-old of making off without payment on three occasions. A police spokesman said: “All we wanted was to spend some quality time with people who’ve been trying to avoid us lately. “Can you play cupid and help us secure a date with some of the county’s most wanted people? - Dean Mazirel, 33, from Worthing, wanted on recall to prison. - Martin Bennett,37, from Brighton, wanted for failing to appear at court. 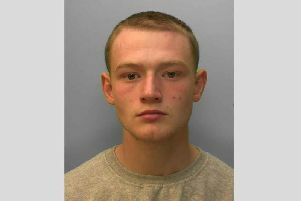 - Callum Gower, 21, of no fixed abode but wanted in Hastings and Rye in connection with assault and drugs offences. - Lee John Cornelius, 40, from Polegate, charged with possessing class A crack cocaine with intent to supply and wanted for failing to appear at Hastings Magistrates’ Court on 28 December 2017. Anyone with information should contact police online or call 101.